Save the Date for our 2019 Chairman’s Circle Luncheon! The event will take place on September 13, 2019, and will feature NPR’s Robert Siegel. Check back for more updates! 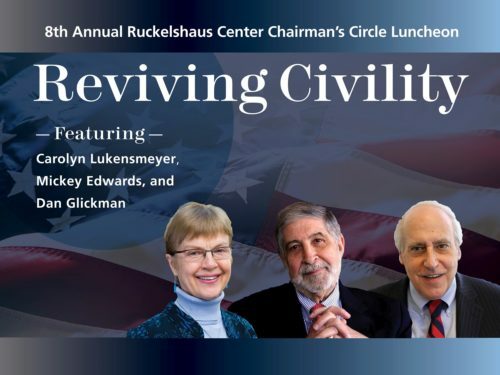 The 2018 Chairman’s Circle Luncheon was a remarkable event, featuring an engaging conversation with the National Institute for Civil Discourse about the current tenor of public dialogue regionally and nationally, and how NICD and the Ruckelshaus Center’s work help us get from mutual recriminations to multi-party solutions. Thanks to TVW’s filming you can view the whole event here! Carolyn Lukensmeyer, Executive Director of NICD, is a leader in the field of deliberative democracy. She founded AmericaSpeaks, an award-winning nonprofit that promotes nonpartisan initiatives to engage citizens and leaders in developing innovative public policy tools and strategies, and formerly served as Consultant to the White House Chief of Staff. Mickey Edwards, NICD board member, is an award-winning professor at Harvard, author, NPR commentator, and advisor to many presidents. He served as a high-ranking Congressional leader for 16 years representing Oklahoma. Currently, Edwards is Vice President of the Aspen Institute and Director of its Rodel Fellowships in Public Leadership. Dan Glickman, NICD board member, is a Senior Fellow at the Bipartisan Policy Center and the Executive Director of the Aspen Institute Congressional Program, a nonpartisan educational program for members of the U.S. Congress. He served as the U.S. Secretary of Agriculture from 1995 until 2001, after representing Kansas in Congress for 18 years. 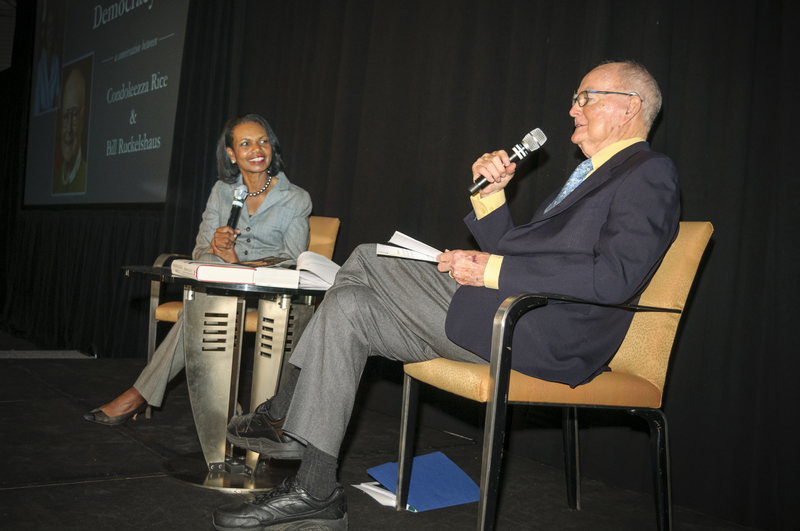 Over 500 business, academic, and community leaders attended the 7th annual Chairman’s Circle Luncheon featuring the 66th US Secretary of State, Condoleezza Rice. Thank you to all who attended! You helped the Center raise vital operating capital that promises to strengthen and sustain the collaborative methodology that allows our government to fulfill its highest functions – fostering practical, win/win solutions to real-world challenges. We are so grateful for your support. Thank you again for joining us in this important work – we couldn’t do it without you! Nearly 300 business, academic, and community leaders attended the 6th Circle Luncheon, A Courageous Moment: the 2016 Election and the Future of America, which took place on September 7th, 2016. The event featured nationally recognized speaker and policy analyst Dr. David Domke as he discussed on the 2016 election, while also comparing current social movements to those in some of the most defining eras in our nation’s history. Watch TVW’s footage of the event. On September 24th, 2015, the Center hosted its 5th Annual Chairman’s Circle Luncheon A Bipartisan Blueprint for Civility & Democracy featuring former U.S. Senate Majority Leaders Tom Daschle (D-SD) and Trent Lott (R-MS). The Senators are co-Chairs of the Bipartisan Policy Center’s Commission on Political Reform that released a list of recommendations in 2014 to improve the legislative process and overcome political polarization. Some of these recommendations include creation of a single, nationwide primary date and five-day work week for Congress, disclosure of all political contributions, and requiring that all Americans 18 to 28 years old commit to a year of “service to their communities and nation”. Watch TVW’s footage of the luncheon, including the Senators remarks and discussion with Bill Ruckelshaus. 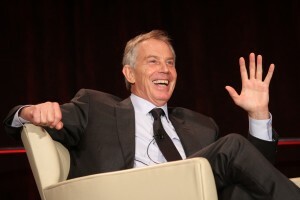 In September 2014, the Center hosted its fourth annual Chairman’s Circle Luncheon, featuring former Prime Minister Tony Blair. He discussed the challenges and opportunities of global leadership. Watch the conversation between Bill Ruckelshaus and Mr. Blair at the luncheon, provided by TVW. 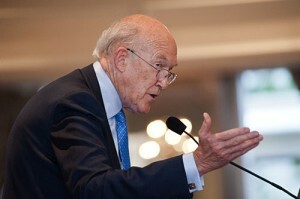 In August 2013, the Center hosted its third annual Chairman’s Circle Luncheon, featuring former Sen. Alan Simpson, a trusted bipartisan leader to whom President Obama turned to co-chair America’s debt reduction commission. He provided candid views on politics, the economy, and the hard and tough choices that lie ahead for America’s leaders. Known for fearlessly confronting intractable issues, Alan Simpson most recently served as the co-chair, with Erksine Bowles, of the National Commission on Fiscal Responsibility and Reform, a bipartisan group looking to erase the United States’ multi-trillion dollar debt. With quick wit and a straightforward style, Simpson tackles the most controversial of topics on the national agenda – bringing both honesty and sensible solutions for moving the country forward. Former Director of the Institute of Politics at Harvard’s Kennedy School of Government, Simpson provides audiences with anecdotes, humor and cutting edge commentary on politics, the media, Social Security and Medicare/Medicaid reform, the economy and much more. The Senator served on the bipartisan Iraq Study Group. Simpson is a member of the National Board of Advisors for the National Institute for Civil Discourse at the University of Arizona. He was a founding Advisory Board member of the University of Wyoming’s Ruckelshaus Institute. Watch Sen. Simpson’s luncheon address and media availability provided by TVW. In August 2012, the Center hosted its second Chairman’s Circle Luncheon, featuring Ronald Brownstein, author of The Second Civil War: How Extreme Partisanship Has Paralyzed Washington and Polarized America and a two-time finalist for the Pulitzer Prize for his coverage of presidential campaigns. Brownstein is the political director of Atlantic Media Company, publisher of the Atlantic, National Journal, and The Hotline. Brownstein formerly served as the National Affairs Columnist for the Los Angeles Times. He has also served as the Times’ National Political Correspondent and the author of the weekly Washington Outlook column. Mr. Brownstein served as the National Journal’s White House and National Politics Correspondent. He appears regularly on MSNBC programs, including Hardball, Andrea Mitchell Reports and Morning Joe, and previously served as a political analyst for CNN. He also appears regularly on Meet the Press, and This Week with George Stephanopoulos and previously served as a regular panelist on Face the Nation. Over 100 influential community leaders were in attendance for Brownstein’s engaging remarks on “Civil Public Discourse in an Era of Hyper-Partisanship.” The Seattle Metropolitan Chamber of Commerce hosted a breakfast event featuring him on the same day, which the Center co-sponsored. The Chairman’s Circle Luncheon discussion was highlighted in a recent article titled, “How political polarization tied this country in knots” featured on Crosscut.com. In August 2011, the Center hosted it inaugural Chairman’s Circle luncheon, featuring renowned historian Dr. Douglas Brinkley. Dr. Brinkley has published extensively on American environmental history, including the widely-acclaimed “The Wilderness Warrior: Theodore Roosevelt and the Crusade for America” and the recently-published “The Quiet World: Saving Alaska’s Wilderness Kingdom, 1879-1960.” He has written about American leaders such as Ronald Reagan, Jimmy Carter and Henry Ford, and conducted oral histories of Neil Armstrong, Stuart Udall and others. Dr. Brinkley spent two days interviewing Bill Ruckelshaus, as a part of his upcoming book on 1960s-70s environmental policy, to create an oral history of Bill’s life and remarkable contributions to public service, corporate leadership, and collaborative policy. The luncheon immediately followed the interviews. Dr. Brinkley discussed his body of work. 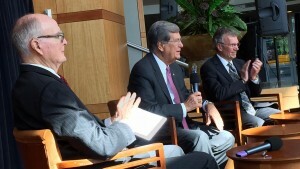 He and Bill shared their reflections on the oral history, and answered questions from the audience. Over 100 people attended, including the presidents of both universities, the oral history sponsors (Meridian Institute, Johnson Foundation at Wingspread, Henry M. Jackson Foundation, and TVW), table sponsors (Green Diamond Resource Company, Madrona Venture Group, and Puget Sound Energy), many members of the inaugural Chairman’s Circle, Advisory Board members, and other distinguished guests.